If Goldilocks had been a pug, she wouldn't have made it past the bowls of food. And nothing would be too hot or too cold for a pug to eat. 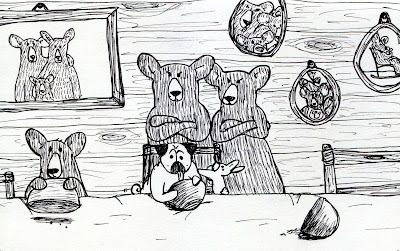 I bet the bears would've arrived mid-licking the bowls, before the pug even gets a chance to sleep in all the beds. This is also for this week's Illustration Friday theme, "suspense." When will the pug turn around and see the bears?? And what will happen then? I started doing this with brown bears but I found them too ordinary looking and so I decided to try this with black bears and loved their super long muzzles and weirdly large ears. 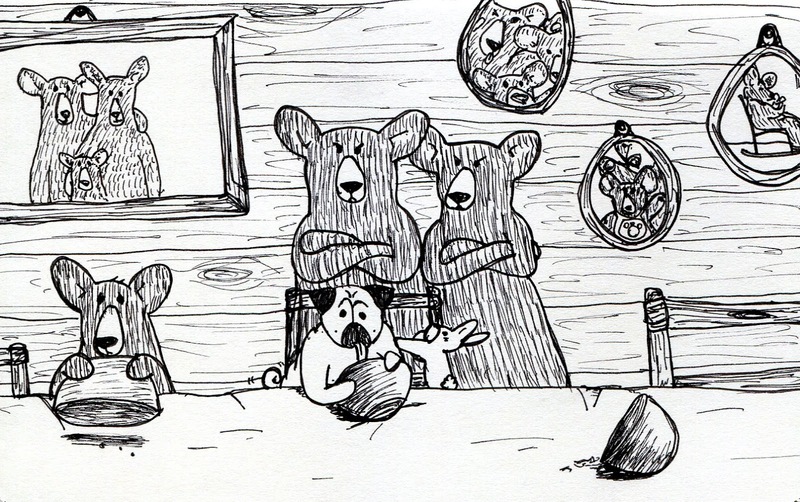 So in this version of the story, Goldilocks is a pug (with her bunny friend), and the three bears are black bears. I predict this pug will wiggle her way out of this jam with cuteness. (Perhaps she or bunny could tell a story in payment for the stolen porridge. )I do love those long ears on the bears - excellent choice! The pug looks so innocent and cute! I like the top illustration, too. It's beautiful. I am becoming a fan of the Pugs! Can't wait to see what they're up to next!